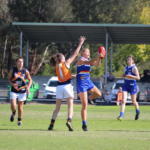 EASTERN Ranges will field a virtually new side in the Under 18 Girls competition this year after 17 top-age players left at the end of last season. Now the Ranges will look to their next crop of youngsters to stand tall and follow on from the impressive first couple of seasons. Female Talent Manager, Jessie Mulholland said the Ranges were pleased with the amount of girls who made Vic Metro squads, and played in the Victorian Football League (VFL) Women’s competition. The Ranges were keeping touch with the top two sides early in the season, but a shock loss to the previously winless Western Jets put a dint in their season. It did however teach the side plenty of important lessons. The Calder loss provided the Ranges with a lesson in wet weather football, as a future AFL Women’s star ran the side ragged. Looking ahead to 2019, AFL Women’s Academy top-age talent, Laura McClelland is the one to watch. Mulholland said McClelland will rotate between the midfield and forward as she looks to give her the greatest exposure to AFL Women’s recruiters. 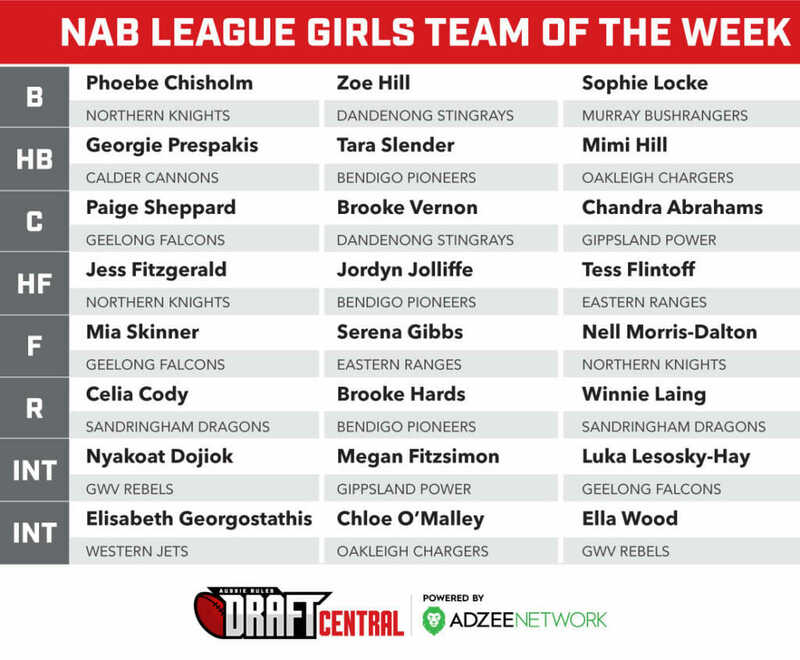 As well as McClelland, Mulholland named Tahlia Merrett and Victorian Netball League (VNL) netballer, Serena Gibbs as other top-age players to watch, while bottom-age talents Olivia Meagher and Tahni Brown are those with high potential for the future. Mulholland said 19 year-old Gibbs would provide a tall target with plenty of development throughout the season. Mulholland said she was hopeful about what the season could produce but knew it would have its challenges considering the youth of the side. Eastern Ranges begin their season on March 3 with a clash against Dandenong Stingrays at Skybus Stadium in Frankston. THE TAC Cup Girls competition continued to produce many highlights across round two, headlined by Gippsland Power securing its first TAC Cup Girls victory. Round two also produced a new ladder-leader, as the Northern Knights sealed top spot with a big win over the Cannons. The Knights join Geelong, Murray and the Eastern Ranges, who are all undefeated after two rounds of an exciting 2018 season. Had a quiet start to the game, but was one of the better Ranges players in the second half. Her first clear possession in the second half was a handball out of congestion to a teammate in space on the outside. She continued to win plenty of contested possessions in close and executed some crucial handballs to the outside. Started to stand out in the second half and took a good mark outside 50 and played on quickly to kick long. One of Eastern’s better players at times, it is just getting her consistency through matches built up. She was impressive with good speed, acceleration, agility, footy smarts and defensive pressure. She has that touch of class, and does the defensive things right as well. You get that sense she has a lot of natural football ability and it is just a case of getting more miles in the legs and thus consistency will come because the talent is there. If stats were recorded she would go close to breaking the marks and intercept marks record. Just does not drop anything and rebounds anything in her vicinity. The opposition began trying to avoid kicking it anywhere near her because of her consistency overhead and her drive out of defence. She is a powerful kick who more often than not hits her target and pushes up the ground too which helps with her team’s forward press. So smart and composed under pressure, put together another four-quarter performance. The dominant forward of the day, she booted three majors in the first half and could have had five. She found space well inside the forward 50, took some strong marks overhead and was a powerful set shot. McClelland showed off her versatility by snapping a goal to go with her set shots. Also provided defensive pressure when out of position and showed good strength on one occasion to fend off a would-be tackler. One of Eastern’s best across the four quarters, played predominantly ruck but covered the ground really well. For a taller player she moves well and this helps her get in the best position in the ruck contests, forcing her way to the front. She won possessions in each third of the ground and when down forward, she presented well leading out. She took a really strong contested mark on the wing in the fourth quarter and just had that presence throughout the game to back-up from another strong day out. #6 Gabriella De Angelis: Was composed inside 50 under pressure and weighted her kicks well. #10 Nicole Cormack: Showed good vision in transition when she marked and weighted a perfectly timed pass to Tarni Brown inside 50. #21 Mikala Cann: She has that lightning few steps out of a stoppage which can burn off her opponent, but also does all the defensive things right as well with some fierce tackling. She had a couple of snaps and kicked a major on the three quarter time siren. Still building to put in a four-quarter performance, but she has some eye-catching moments at times. #39 Olivia Meagher: Only turned 15 a few months ago, but she is one to watch over the coming years. She rushed her shots on goal a bit, but laid some bone-crunching tackles – including one on Lucinda Cripps – to lock the ball inside 50. She has great acceleration inside 50 and strength, breaking a tackle, but she sprayed the shot. Would have been in the top couple on the ground had she finished the few shots off. #40 Tahlia Merrett: Played up forward and rotated through the ruck with Sarah Kendall. Merrett is a strong mark of the football, kicked a couple of goals early and seemed a reliable set shot. She also worked well at ground level so the bottom-age player showed some good signs on the weekend. #47 Jess Provan: Took a great contested mark in front in the third quarter, but missed the goal attempt. Found space later on and took a good mark, so was providing a target up forward. #48 Lauren Szigeti: Took a few contested marks in the first quarter and was a rock in defence. She fended off an opponent in the third term charging out of the defensive 50 and cleared the ball inside her team’s own forward arc with a lovely kick inside 50 to Olivia Meagher. #49 Charlotte Wilson: Had a great highlight with a strong intercept mark and kicked it clear from defence. Heath had a quiet first quarter before working more into the game after quarter time. She did not have as much time and space as last week, so used her high work ethic and running ability to work harder to get into space. She peeled off her opponent a couple of times and managed to get free to be an option on the wing. An accurate kick of the football, Heath backs herself when heading towards goal and has some quick first few steps out of a stoppage. Had a great smother in the final term, then laid a tackle backing up, to lock the ball up. Like many teammates, the first quarter or so, Allen was not as influential as the week before.. But by the time she walked off the ground at the end of the game, Allen was one of the better players on the ground. Early on her defensive work was top, laying some important tackles and when she did have the ball, she was composed. It was the second half where she began to have a huge influence on the game. With the game slipping away, Allen played on from a kick-out, booted it to a teammate outside 50, received the handball from that teammate and kicked to half-forward. What showed her smarts was rather than just bombing long to a predictable area, Allen saw Georgia Macpherson ahead who had taken a multitude of intercept marks. So Allen readjusted her running and kicked to the other flank, using it as another avenue to goal. She did that a couple of times, using her fantastic penetrating kick to find targets up forward and just worked hard throughout the game. A high football IQ. One of the Stingrays best early on, she stood up in the first half. She showed good speed out of the stoppage and tried to make something out of nothing charging through a few opponents. Unfortunately for her she was brought down and got pinged for holding the ball. She kicked the Stingrays’ first goal courtesy of a 50m penalty, but worked in tandem with Heath through the midfield and used it well by foot. Had a quieter second half, but still did some nice things. Like many of her teammates, Cripps had a quieter first half and worked into it in the second half. She was caught a couple of times with quicker forwards opposing her, but she continually tried to repel attacks out of the back 50. The biggest attribute to notice with Cripps is her ability to stay calm under pressure and never take her eyes off the contest. She took a huge back-with-the-flight mark in the final term putting her body on the line to stop a forward througst. She also used her strength to fend off opponents and had a big final term. The tall forward was one the Stingrays’ best across the four quarters, because she did everything you could ask of a forward – she led, presented, took grabs and provided defensive pressure. Early on she was taking plenty of marks inside 50 and just got the better of her opponent on the lead. She laid a great hip and shoulder on Sarah Kendall in the second quarter, and was always buzzing around the forward 50. #4 Jess Guy-Toogood: Has nice skills which she showed with ball in hand, moving in transition from the midfield to the forward 50. #18 Saige Bayne: Still only 15 years-old and popping up with some good highlights through the match. She goes in hard to the contest and is able to hit targets when looking forward with good vision. #20 Eliza Wilson-Macdonald: Came into the side this week and played on the inside with some great defensive efforts. She worked hard throughout the game and nearly all of her touches were under pressure. The left-footer spun out of a contest to get the ball forward at one stage, and later on won a one-on-one contest against Mikala Cann to get the ball clear, so some good signs. #28 Tyanna Smith: Another 15 year-old who has a superb first touch. In one instance there was a high bouncing ball in the middle of the ground, and Smith took it cleanly, ran forward and produced a lace-out kick to Samantha Ryan leading out. #55 Harmony Thomas: Looks dangerous at times given she is strong overhead and finds space, just needs to nail her shots on goal for a more complete performance. Laing started in defence and was quiet, but moved into the midfield later in the second term and began to build. Her second half was as good as anyone else on the ground, and to start the third term, she won about five disposals in just a few minutes. She is a tough inside midfielder who constantly hit the packs hard and once moving back to the back-line in the fourth quarter, had moved into more ball-winning positions. She moved up the ground and peeled off her opponent more to impact the contest. Laing showed off some top acceleration in the final term, taking a shot on goal after bursting away from an opponent, but the shot just went wide. She was super impressive throughout the first three quarters off half-back. She has a long raking kick and her bodywork was great. She not only won the hardball, but backed herself in and took the opposition on coming out of defence. She teamed up well with Winnie Laing and Sarah Hartwig to provide plenty of drive out of the back 50. She linked up in transition with her midfield and while she did not see as much of it later when Sandringham had it up the other end, she was still an important contributor when required. In the end, probably best on the ground in my eyes. She played a pivotal role off half-back, taking some crucial intercept marks and providing plenty of rebound. Had a huge run-down tackle on Jasmine D’Amato saving a potential goal in the first half, and was really composed with ball in hand, executing the quick-fire handball when required. Hartwig showed her speed on the lead when she made up ground to spoil an opponent, and also worked her way to a contest in the third term to kill off a ball and put it out of bounds for a stoppage. Her best effort came in the third term when she won a on-on-one at ground level and executed a clean handpass to a teammate who was running by. Had she lost the one-on-one, the Dragons back 50 would have opened up and Oakleigh kicked a major. She took a great contested mark in the fourth quarter and used her good foot skills and agility to sidestep an opponent. Carlton fans will no doubt be keen to keep track of Abbie – daughter of Andrew – and on the weekend she was quite impressive. Just had some little moments of brilliance as she played inside and was quick with her hands in close, and had some good strength and power to burst from a stoppage. She worked her way to the front in a marking contest after initially being out of position, and earned herself a free kick. Still a few years off being top-age, but McNamara is certainly a talented junior. She has a good mix of offensive and defensive traits, and has both the ability to impact a contest on the inside or outside. McNamara went in hard on one instant, won the ball, sprinted away and kicked a goal from just inside 50. People talk about levels of ability and I think her best is very high level and the fact she has a couple of years still left in her development, she will be a very exciting prospect come 2020. #3 Sophia Rothfield: A clean midfielder who has a good first touch off the deck and is able to hit targets going forward. She showed some strong hands when marking inside 50 and almost kicked a goal in the third term before it was smothered, but a moment later she snapped truly and earned the six-pointer. #5 Jasmine Tait: Top-age player with a fair bit of pace. She stopped Gemma Lagioia in her tracks early with a great tackle, and she was winning her fair share of the ball through the midfield. Did not do too much wrong and seemed to be a smart and clean user by hand or foot particularly in tight, handballing clear. #11 Taylah Tysoe: Showed some electrifying dash off a wing going forward in transition. #13 Daisy Walker: A clean user with ball in hand, Walker was impressive off half-back and composed under pressure. She also provided plenty of defensive pressure on the ball carrier to unsettle them going forward. #20 Alanna Dalley: The tall ruck held her own against Bridie Winbanks and showed some good bodywork. She did well to protect the ball on the occasions she took it clean out of the ruck, providing a block on her opponent to allow her teammates some extra space. #31 Bryanna Arnold: Had an amazing highlight when she kicked a goal later in the game. Her long booming kick inside 50 was reminiscent of Leigh Brown’s bouncer against Geelong in the preliminary final, when it looked to have missed the goals entirely with a defender chasing it, then it took a right angle turn to bounce back into the goals. #33 Molly Denahy Maloney: Presented up forward and kicked a great goal on the run in the second term. #46 Jemma Owen: The Dragons captain showed off a penetrating kick and ability to hit targets inside 50 with a perfect pass to Isabella Stutt late in the game. When up forward she was rewarded for a great lead, marking the ball through a desperate dive. Unfortunately for Owen, her shot went wide. #46 Alice Burke: Read the opposition taps perfectly and has some serious wheels sprinting away from the contest. In another instant she showed her strength by stealing the ball out of an opponents’ hands and clearing it from the coal face. #49 Laura Amelung: Another Dragons defender who provided good run off half-back and showed composure under pressure. She took a good contested mark early despite being undersized in the one-on-one, and also looked dangerous when forward, taking a good mark on the ground in the final term but her shot went wide. #50 Holly Bate: Just a clever forward who managed to goal from a snap off a second’s notive in the second term. She did it again in the third term, casually picking it off the deck and kicking a goal off a step to hand her goal number two. She also laid a bone-crunching tackle on Charlotte Moon late in the game. #53 Isabella Stutt: Presented as a dangerous forward option, just could not finish off her hard work. Took a great mark but her shot hit the post, and another snap from a stoppage just missed, but she showed some impressive signs. Showed signs last round, but stepped up her game this week I felt because she was crucial coming out of defence and through the midfield. She wins the ball both inside and out, has clean disposal and does not panic. By the end of the day I felt she was in Oakleigh’s top couple of players because of her ability to keep a level head while Sandringham was applying the pressure. One notable attribute she had was her ability to break through tackles and still remain balanced while kicking. She had a huge last quarter off half-back. Started like a house on fire and was just consistent throughout the game. McLaren started in the midfield and worked her way to half-back where she held up well charging out of defence. She even had a shot on goal after fending off an opponent at half-back and kicking long, but it was stopped on the goal line. She took a huge contested mark at full-back and just continually repelled the Dragons attacks. She played up the ground at times and kicked the ball well inside 50, but went a little quiet later in the game when Sandringham was in control. A player I thought had a number of good moments, particularly after quarter time. She won the ball along the wing and had the smarts to dispose of it quickly when under pressure. She laid a goal-saving smother and added great tackling pressure in defence. Her last quarter was outstanding, linking up with Jasmine D’Amato coming out of the back 50, and provided good drive to help the Chargers stem some of the Dragons’ flow inside their attacking zone. O’Malley just had a really consistent four-quarter effort. She won plenty of the ball early when the game was hot, and she worked hard in transition through the midfield. She continued to work throughout the match and while others might have stood out at times with their zip, O’Malley was just a workhorse through the centre of the ground and one of the better Chargers on the day. Another top performance from Lagioia, backing up her round one efforts. She certainly stands out with her cleanness and athletic ability. She has the smarts to win her own ball or receive it on the outside, and a strong athletic profile which sees her use her agility and acceleration to dance around opponents. She also has the tendency to release teammates with quick fire handballs when she is under pressure, waiting for the precise moment to give it off. She took a great mark in the first half and spun out of traffic to kick long to the goal square. Lagioia is a smooth mover who managed to juggle a mark in front of her opponent keeping it away so her defender could not spoil the ball. I stand by my rare use of the word “elite” when discussing her foot skills. #2 Mimi Hill: Really good hands in close, got plenty of touches early and just fired out handballs left, right and centre to teammates to keep the play moving. One of Oakleigh’s best in the first half, covering great ground across the field. Did quieten towards the end, but still a solid performance. #11 Bridie Winbanks: Had a huge battle in the ruck and at the very least broke even. Uses her strong frame well and has a penetrating kick. Hits targets more often than not, and found Gemma Lagioia leading out from the goal square with a dart pass. #19 Emily Harley: Had a quiet first half, but stepped up after the main break. She was playing forward after her stint in defence in round one, and did a few nice things. Harley had the smarts to kick along the ground in the fourth term rather than pick up the ball and be caught holding it. She laid her own run down tackle in third term, and crashed through a few packs. Did give away a few frees but her intent was good. #21 Charlotte Moon: Won a crucial one-on-one against Eliza McNamara late in the game and buzzed around the contest. #38 Daisy Bateman: Was not allowed the same time and space as round one and had her work cut out for her against the strong Dragons defence. She still managed to snare a few overhead marks and has that penetrating kick for goal. Earned a free kick after a strong tackle, but missed the shot on the three quarter time sirem. #43 Emily Hastie: Had a few good highlights throughout, showing her strength in the air. Laid a tough tackle after dropping the mark, showing her second efforts. #52 Lily Harris: Laid a huge tackle to win a holding-the-ball free on a tight angle in the pocket, just unfortunately missed the shot to capitalise on her defensive effort. #68 Allysha Dyer: The overager used her frame well to win contested ball around the stoppages. She played at full-forward and therefore did not see a heap of action, but played her part when she got involved. Given the Power’s dominance early, Grant was quiet. But after quarter time you could see the influence she can have when up and about. While she did not dominate in the forward 50 arc, her running power to get up the ground and crash packs or win the ball at ground level on the wing and release a teammate, was clear. She is so strong in the tackle and gets her arms free, with the unique ability to stand up in a tackle and fire out a handball to keep the play moving in transition. Grant was a player constantly watched by the opposition, and while she did not have the game on her terms, she found a way to still help influence the match through her teammates. A hard nut inside midfielder who also has outside pace. Still a bottom-ager, Georgiostathis is strong and powerful, but showed some toe when she tucked the ball under her arm, took a few bounces and used the space along the wing to kick forward. Later on, she took on a couple of opponents, backed herself and kicked cleanly under pressure. Took a good intercept mark late just inside 50 but just missed the target. Overall she was a standout through the midfield. One of the Jets’ best midfielders with Elizabeth Georgiostathis, winning plenty of ball at the coal face. She continually applied the pressure through the midfield, laying a multitude of tackles and earned herself free kicks, including one that saw her force an opponent to kick the ball out on the full. Forsythe showed off her strength in the air, taking a strong contested mark about 30m out under pressure, and kicked a vital goal for the Jets. The 16 year-old might be two and a half years away from being draft-eligible, but she is already standing out down back for the Jets. She is strong overhead, backs herself in and puts on pressure against the Power forwards. Pritchard has a penetrating kick that is reliable coming out of the back 50, and is also not rushed when under pressure. She executed a handball off the deck to a teammate without fuss and just generally stood up against the onslaught when the power were taking control. Rebuffo teamed up well with Pritchard in defence and after initially being flooded with inside 50s in the first term, shored up the defensive team and made a number of one percenters. She dove across the goal line in the second term to save a potential Tyla Hanks goal. After half-time, Rebuffo began impacting offensively, running off half-back and charging out of defence. She became one of the better Jets across the game and produced a crucial goal-saving tackle late. One of the big reasons the Power did not kick a goal after quarter time. #2 Caitlin Gashi: Showed good agility and speed around the stoppages, one of the best Western Jets early. Was clean with her possessions in close or on the outside. #4 Leah Spargo: Great defensive efforts, laid a huge tackle to stop a rebound and had the quick thinking to move the ball on quickly. #6 Laura Wright: Laid a huge tackle on Tyla Hanks in the opening minute of the third term, and continued to apply plenty of defensive pressure to the opposition, winning a number of frees through holding the ball or getting the pill first. #8 Emily Gardner: A clean user of the ball, won a free kick for a great tackle, but missed the set shot. #21 Maddison-Eve Fenech: Went in hard from start to finish laying a number of bone-crunching tackles in defence. Made her opponents earn every touch and never stopped fighting for her side. #25 Taylah Kolevski: Played in the ruck and covered the ground really well. #26 Isabella Negri: Has a unique combination of speed and power. Fended off a number of players under pressure and then used her jets to burst away and kick forward. #27 Payton-Ani Ozlos: Tough customer who loves the physical side, laying a number of huge tackles. #39 Cleo Saxon-Jones: Kicked an opportunistic goal in the square, with smart thinking to be in the right place at the right time. She kicked her second goal in the second quarter with another good snap and looked to be the Jets’ most damaging forward in the first half. #40 Sharnie Whiting: A powerful kick of the football and strong overhead. Fended off an opponent when running with the pill. #43 Caitlyn Greiser: A powerful player with a great turning circle. Took the mark just inside 50 and turned her opponent inside out to get onto her preferred side to kick to the danger area inside 50. Hauesler played out of defence and the role really suited her considering her strengths of disposal and defensive pressure. She was clean by hand or foot, provided some great dash off half-back and had excellent vision and a low, penetrating kick. I thought she was the next best behind Tyla Hanks because of the drive and rebound she gave her side. She also applied great tackling pressure, and helped direct the defence. Another player who stood out for Gippsland, covering the ground well, but mostly playing as a damaging forward. She kicked one of the goals of the day in the first term with a snap from the pocket and then backed it up with a second goal on the run. She took a huge mark overhead and showed off her good vertical leap. Webber just looked to be getting into dangerous areas and also has the strength to go with it, fending off opponents at times, and winning the contested ball. Her work ethic was obvious when she took a mark in the centre square, the kick was smothered but she backed it up and won the hard ball to have a second chance and kick it forward. Another polished performance from Hanks who looked like she enjoyed the freedom of some time up forward early. She booted two goals and almost had a third if it had not been smothered on the line. It was just a typical performance many fans have come to expect from her, winning contested ball, winning clearances and then getting to the outside and hurting teams in transition. She reads the play so well that she runs off her opponents at stoppages and can be found in space, which is how she kicked her first goal. Later on in the match she was also providing some run out of half-back when the game was slowing down. Copped a knee to the back in a marking contest but got back up and took the free. Hanks probably suffered leather poisoning from the match and you would be forgiven for thinking she brought her own football. Last week she worked into the match in the second half and it seemed she kept the momentum going this week. I thought she was one of the best Power players, winning the ball in close and applying plenty of defensive pressure. She laid a huge tackle in the third term, but was unlucky to be pinged for in the back. She stepped up to another level in the second half, winning plenty of the football and being impressive in close, as well as on the outside. A really promising performance. Another top Power player who I ranked behind Hanks and Haeusler such was her impact on the game. She played through the ruck and also up forward, creating a highlight in the first term with her goal. She fended off an opponent and continued to run, kicking a goal and getting the crowd up and about. She really got amongst it early, winning hitouts and covering the ground well for a taller player. Built on her first round performance and seemed settled in the second round. #2 Samara Beaton: After a quieter first half, Beaton really began to get involved in the second half, laying a great smother and getting amongst it. #4 Jennifer Ross: The overager played her role in the forward line, taking a good intercept mark in the pocket. #8 Chandra Abrahams: Still quite young but there’s talent there, seems to have a fair bit of footy smarts. Just a couple of times I noticed she had the IQ to tap the ball on or have a deft touch to a teammate which would not have been recorded as a disposal, but still clever. Playing up forward but would not be surprised to see her develop into a tall midfielder down the track. #12 Megan Fitzsimon: Spread really well from the stoppages and has a thumping kick on her. She penetrated through the opposition defence on one occasion, pumping it deep into the danger zone. #58 Amy Dunn: Had an influence up forward and assisted Ferguson in the ruck. She looked to be a damaging forward with the way she lead into space and took some strong contested marks. She also set up her teammates and provided a real target down forward, particularly in the second quarter. Unfortunately the wind stopped her from adding a few majors to her day. #65 Julia Redmond: Liked her game down back, she was a rock on the last line and just did everything right defensively. She broke two tackles deep in defence and backed herself to bomb to safety. She also took a couple of huge marks to save potential goals when the game was on the line. Had an electric start to the game and was probably the standout in the first quarter. She was able to penetrate the ball forward with ease, even in the midst of a strong tackle or getting chased down by the Knights midfielders. The Calder captain took everything that came her way- you could see she was being targetted by the Knights players. Prespakis was a ball magnet and did all the little things to help her team out as they struggled through the contest. In one instance, she followed up in the ball when it was in a tiny hole of space, picked it up cleanly, trapped the ball and side-stepped her opponent when she began to move the ball forward. She is such a strong player. Warburton put in the hard yards for the Cannons in defence. In a young back-line, she brought a steady hand to the defensive line-up, and was able to slow the ball down and act composed when the Knights quickly burst forward. The defender displayed some great second efforts, which was really useful in a game where Calder did not give up, despite the Knights’ constant pressure. She will be one of Calder’s best on-field leaders as the season progresses. She was very brave on the last line of defence. The Knights forwards did not stop attacking all day, but she held herself with composure when the ball reached her. Elias took some great marks and also laid some wonderful tackles. In one instance, she laid a strong, goal-saving tackle just before the goal-line, and cleared the ball out with a booming kick when she received a free kick for holding the ball. She is only a small player but she is very skilful, and without her, the margin could have been much worse for the Cannons. Grace Dicker was one of the fastest players out there. She was able to use her acceleration to her advantage multiple times, especially when running away from opponents. She was particularly influential on the wing, where she was able to use the space to burst free from any pressure from her opponent trying to chase her down. Dicker also impressed with some great run-down tackles, showing that she could utilise her speed both in offence and in defence. Patrikios showed composure with the ball in hand and her football skills looked a class above. She uses the ball incredibly well and has quick hands. Patrikios was able to bring her teammates into the game thanks to her footy smarts and unselfish attitude with the ball in hand. She is a good reader of the footy, and can accelerate well when she gets her hands on it. She also laid some aggressive tackles, which is an element of her game that she continues to improve on, and will hold her in good stead for the rest of the year. Bennett consistently displayed quick and clean hands throughout the contest at RAMS Arena. She was always able to spot up a target, thanks to her wonderful peripheral vision. Bennett would often find the ball in congestion and pick it up cleanly – a skill which really highlighted her footy smarts. She was able to get on the scoreboard herself when she read the ball brilliantly off the contest to snap it through for a goal. Bennett was everywhere on the day, and is proving to be a very important player for the Knights. Gabby Newton was a huge force in the ruck, winning almost every hit-out. She managed to do this against one of the best rucks in the competition in Calder’s Carla Rendelmann. Newton’s impact was not just felt in the ruck though, as her impact was felt with strong marks, aggressive tackles and clean hands. In one instance, she won a two-on-one convincingly, which showed not only her strength, but also her smarts. Jess Fitzgerald caught my eye when she burst through the middle of the ground in Paddy Dow fashion to boot the ball forward. She is definitely an impact player, highlighted by a perfect tackling technique where she wraps both arms strongly around her opponent, leaving them nowhere to go. I was super impressed by Fitzgerald’s ability to get and go because it showed that she has confidence in herself to make the right choice with the ball in hand. She was in everything and when the she got the ball in hand, she could not be stopped. Provided a fantastic target for the Knights inside 50. Bannan has really strong hands and can work up the 50 really well. She was able to kick two goals on the day, and was involved in plenty of scores. What stood out to me was her second efforts. In one instance, her kick was smothered but she had the awareness and reflexes to pick the ball up off the ricochet and boot it forward – a class act. I thought her third quarter was really influential, as she started to impose on the contest with her marking prowess and proactivity in front of goal. Nell Morris-Dalton was the strongest player out there. In one instance, she broke away from a contest with two players tackling her. She was able to penetrate the ball forward magnificently, as her kick was not only long and booming, but it consistently found space for the Knights forwards to run into. This was crucial, as most of Northern’s goals were from players running into goal, or picking up and snapping the ball inside 50. Morris-Dalton looked like an on-field leader for the Knights, and showed poise with the ball in hand. #5 Maddy Brancatisano: Simply brilliant in the midfield. Was in and under every contest and continued to push hard for the Knights despite their comfortable lead. A fantastic leader for the club. #22 Britney Gutknecht: Her strong kick helped the Knights continue to pile the pressure onto the Cannons. In the third quarter, she delivered a magnificent kick onto the chest of Alyssa Bannan in the forward line, then burst forward to follow up the kick, as Bannan elected not to go for goal. She not only knows her own game well, but she also has knowledge about the way her teammates play. #17 Ciara Fitzgerald: Good marking and composed kicking from Fitzgerald. Was able to deliver a great centering kick into the forward line in the third quarter, and continued to step up her game in the fourth. #37 Faith Holloway: She is the personification of speed and endurance combined. Holloway highlighted this through a great run-down tackle in the first quarter, in which she accelerated hard and fast to win a free kick. #24 Alex Pronesti: Pronesti is such an aggressive player, making her a really dangerous target up forward. But once she gets the ball in hand, she is very composed and uses it well. This was highlighted when she kicked her second goal of the day, as she was able to gather herself and run into goal while being surrounded by Cannons players running towards her. FUTURE Bendigo Pioneers and GWV Rebels’ TAC Cup Girls’ sides were the standout performers in the under 16s V/Line Cup. The Pioneers had a dominant carnvial, registering two huge wins and finish with a percentage of 514.29 ahead of Western Bulldogs NGA (GWV Rebels catchment) on 485 per cent. 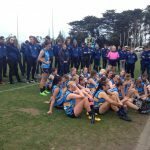 Geelong Falcons maintained its unbeaten streak across all age groups at the V/Line Cup to finish third after two close victories. Peninsula Stingrays and Gippsland Power both recorded wins, while the Yarra Ranges, and the split Murray Bushrangers’ sides of Goulburn Murray and North East Border got a good feel for high level football. For many of the players, they will head into the TAC Cup sides as bottom-agers, or will experience TAC Cup football in the coming years as the competition continues to grow. Bendigo Pioneers’ big wins came over Goulburn Murray (38 points) and North East Border (49 points). Madeline Marks won the leading goal kicker for the Pioneers’ booting four goals, while Gemmi Morrell, Elizabeth Snell and Mia Ward all booted three goals across the two games. Snell was a shining light along with Morell, Maeve Tupper and Sharmaine Reilly who were named in the best in both games, while Grace Barton was dubbed best on ground for her performance in the Pioneers’ win over Goulburn Murray. Western Bulldogs NGA had an equally impressive carnival, claiming a 38-point win over North East Border, before restricting Yarra Ranges to one behind in a 39-point victory. Chloe Leonard starred up forward in the win over North East Border, booting five goals, while Renee Saulitis backed up a promising performance in that game to boot three goals in the second match. Across both games, Nyakoat Dojiok, Sophie Molan and Nekaela Butler were named in the Bulldogs’ best and they are no doubt names that will pop up in Rebels’ colours soon. Geelong Falcons had much tougher matches with a two-point victory over Peninsula Stingrays before a seven-point win over Yarra Ranges. Madeline Chandler‘s three goals against Eastern Ranges helped the Falcons get home in an accurate performance, leading the side’s goal kicking from Emmalyn Nekrep who finished the carnival two majors. Daisy Smith, Poppy Schaap, Luka Lesoksy-Hay and Jerusha Devakonda showed off their consistency, with the quartlet named in the best in both games. 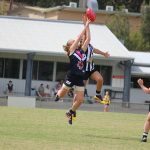 After a bitterly disappointing narrow two-point win against the Falcons, Peninsula Stingrays showed what they were capable of against Gippsland Power, recording a five-goal win. Amie Carroll and Alisha Kelly booted team-high three goals each, while Lucy Cripps, Saige Bayne, Darcy Fennell and Abbey Jordan might be names to keep an eye out for in future years for the Dandenong Stingrays – all of whom were named in the best in both games. Gippsland Power had a mixed carnival with one big 38-point victory, before suffering a 30-point loss in the second game. 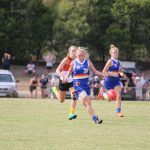 Lily-Rose Williamson booted three goals in a best-on-ground performance against Goulburn Murray, while Isabella Hodder managed two majors in the win. Across both games, Hodder, Holly Andrews and Chandra Abrahams were named in the Power’s best. Yarra Ranges, Goulburn Murray and North East Border all finished the carnival without a win, but showed signs they were capable of matching it with teams throughout patches. 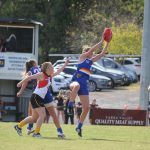 For Yarra Ranges, Tahlia Merrett was the sole goal kicker with two majors, while Paige Buruma, Stephanie Williams and Alice Smith were named among the best in both games. For Goulburn Murray, Lakeea Charles and Aurora Smith booted a goal each, with both girls consistent across the two games, as were Georgia Gall, Kate Adams and Elle Brooks who were named in the best twice. For North East Border, Keeley Skepper finished with two goals against the Western Bulldogs, while Emily Nicholson booted the side’s other major. Skepper and Mikaela Shepherd were the side’s best across the two games with Vashti Miller. Gippsland goals: Lily-Rose Williamson 3, Isabella Hodder 2, Megan Fitzsimon. Gippsland best: Lily-Rose Williamson, Chandra Abrahams, Isabella Hodder, Holly Andrews, Maddison Shaw, Shanara Notman. Goulburn Murray best: Georgia Gall, Kate Adams, Lakeea Charles, Ellie Mifka, Elle Brooks, Aurora Smith. Geelong goals: Tess Craven, Emmalyn Nekrep, Laura Ryan. Peninsula goals: Amie Carroll 2, Alisha Kelly. Geelong best: Luka Lesosky-Hay, Ella Mahoney, Poppy Schaap, Charlotte Simpson, Daisy Smith, Jerusha Devarakonda. Peninsula best: Lucy Cripps, Saige Bayne, Lucy Grocock, Amie Carroll, Darcy Fennell, Abbey Jordan. Bendigo goals: Mia Ward 2, Madeline Marks 2, Gemmi Morrell, Elizabeth Snell, Rachael Stubbings, Tiana Shepherd. Goulburn Murray goals: Lakeea Charles, Aurora Smith. Bendigo best: Grace Barton, Sharmaine Reilly, Maeve Tupper, Elizabeth Snell, Gemmi Morrell, Olivia Taverna. 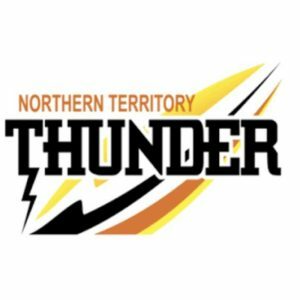 Goulburn Murray best: Aurora Smith, Kelsey Moylan, Kate Adams, Lakeea Charles, Georgia Gall, Elle Brooks. Western Bulldogs goals: Chloe Leonard 5, Laura Fitzgibbon, Isabella Simmons, Lucy Moloney. North East Border goals: Keeley Skepper 2, Emily Nicholson. 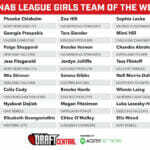 Western Bulldogs best: Nyakoat Dojiok, Chloe Leonard, Sophie Molan, Renee Saulitis, Nekaela Butler, Victoria Jewell. North East Border best: Keeley Skepper, Mikaela Shepherd, Vashti Muller, Jessica Ward, Chelsea Hargreaves, Samantha Pritchard. Peninsula goals: Alicia Kelly 2, Lucy Cripps, Keala Kennedy, Amie Carroll. Peninsula best: Keely Byrne, Darcy Fennell, Sylvie Repellin, Abbey Jordan, Saige Bayne, Lucy Cripps. Gippsland best: Holly Andrews, Chandra Abrahams, Bella Brown, Megan Fitzsimon, Isabella Hodder, Samara Beaton. Geelong goals: Madeline Chandler 3, Emmalyn Nekrep. Yarra Ranges goals: Tahlia Merrett 2. Geelong best: Daisy Smith, Laura Gardiner, Jerusha Devarakonda, Poppy Schaap, Luka Lesosky-Hay, Sophie Milsome. Yarra Ranges best: Paige Buruma, Stephanie Williams, Jasmine McNair, Alice Smith, Savannah Bowden. Bendigo goals: Gemmi Morrell 2, Elizabeth Snell 2, Madeline Marks 2, Mia Ward, Grace Barton. North East Border goals: Nil. Bendigo best: Elizabeth Snell, Jemma Finning, Maeve Tupper, Gemmi Morrell, Sharmaine Reilly, Kate Douglass. North East Border best: Georgia Moorman, Vashti Muller, Keeley Skepper, Mikaela Shepherd, Chloe Frost, Charlotte Beavan. Western Bulldogs goals: Renee Saulitis 3, Isabella Simmons, Lucy Moloney. Western Bulldogs best: Renee Saulitis, Sophie Molan, Nyakoat Dojiok, Nekaela Butler, Isabella Simmons, Jordie Mcauliffe. Yarra Ranges best: Alice Smith, Mietta Kendall, Stephanie Williams, Paige Buruma, Catherine Chamberlain, Tahlia Merrett.